The Rev. Darius Pridgen addresses the crowd from the stage at Kleinhans Music Hall during a special True Bethel Baptist Church Easter Celebration on Sunday. The Rev. Darius Pridgen used his Easter Sunday sermon to call on parents to resurrect themselves as better role models and advocates for their children’s education. 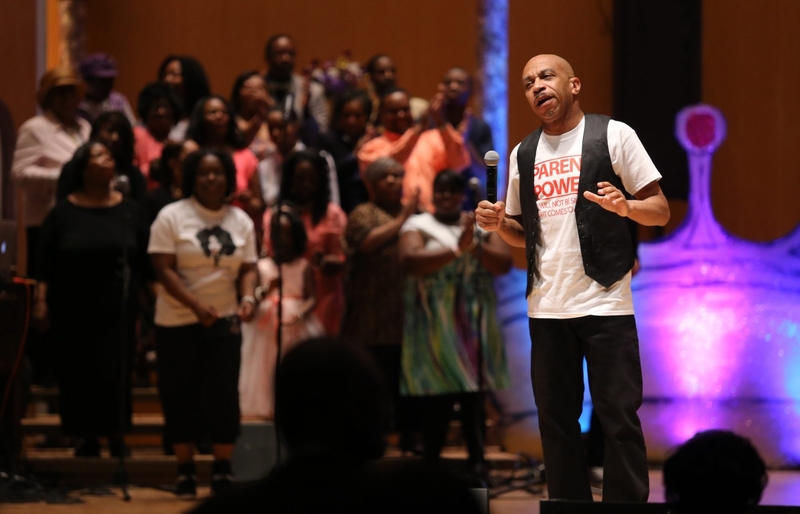 Pridgen’s high-octane exhortations – often laced with humor and interspersed with joyous gospel singing and dancing – ignited the True Bethel Baptist Church congregants who nearly filled Kleinhans Music Hall. “Parents should be not only marching in the street, but they should also be participating in their child’s education, meeting with teachers and demanding not only excellence at school but at home, also,” said Pridgen, who was joined by the leader of the district’s parent group. Trading in his usual dapper dress for a vest over a “Parent Power” T-shirt, Pridgen, also Common Council president, read off a list of successful Buffalo schools, followed by a considerably longer list of “priority” and “focus” schools that aren’t meeting state standards in English and math. He summoned parents and children from these schools to the stage to put a human face on their situation, all the while urging parents to do more and expect more for their children’s education. “I believe that when Buffalo comes together, these schools that are in red will be in green,” Pridgen said. He chastised young parents whose priorities, he said, were misplaced. “If you can stand in line to buy them Nikes as soon as they come out, you can make sure they get their homework done,” Pridgen said. He said attention paid to the future of the Buffalo Bills overshadowed the far more important future of Buffalo’s schoolchildren. “We need to ensure that we bring as much attention on our children’s education as we do for a new Bills stadium, because if we cared as much about their education as we do a stadium, there would be groups coming together all over this city,” Pridgen said. Pridgen, who annually uses the Easter service in Kleinhans to highlight an important issue, offered a list of things parents needed to do to better prepare their children to enter school and to advocate on their behalf. That included ensuring children knew their colors, were exposed to a large vocabulary and could spell their own name. “Don’t blame on teachers what you won’t do for yourself,” Pridgen said. He also repeatedly called on parents to band together to demand the best quality education possible against forces that, he said, wanted to keep them and their children down. Samuel L. Radford III, president of the District Parent Coordinating Council, urged parents to join the “10,000 Strong Campaign” launched with the goal of getting that many parents to request transfers of children out of poor schools into schools in “good standing” by the April 30 deadline. A program distributed by the parents group as people entered the music hall called on parents to request transfers online at www.buffaloschools.org. A rally in support of the campaign is also planned at 5 p.m. Wednesday on the front steps of City Hall, prior to the Board of Education meeting.